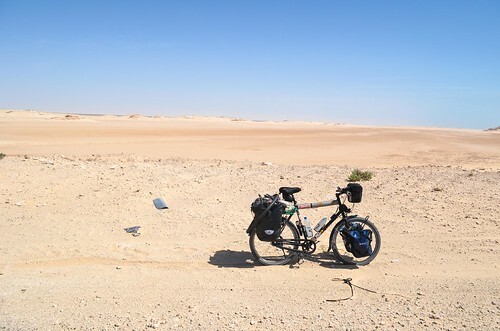 In the morning, the strong wind pushes me quickly through the last 35 kilometers until the border. 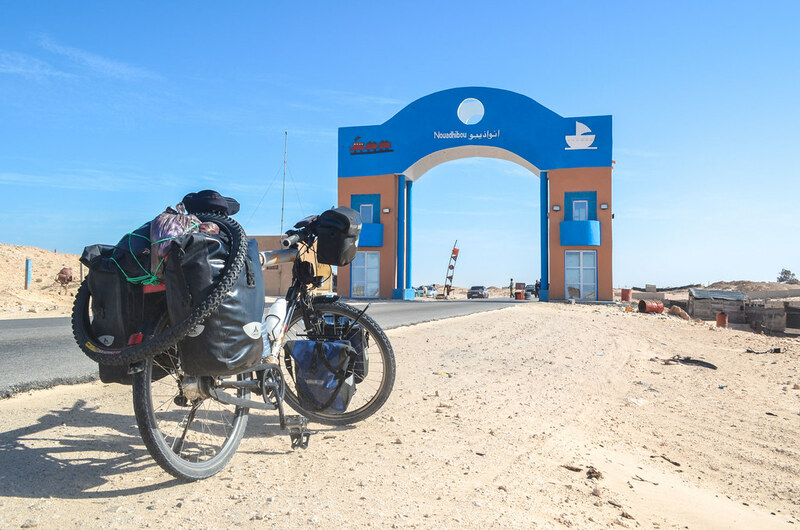 After 2400 kilometers cycled in Morocco and 1400 km in Western Sahara, I will finally change country. 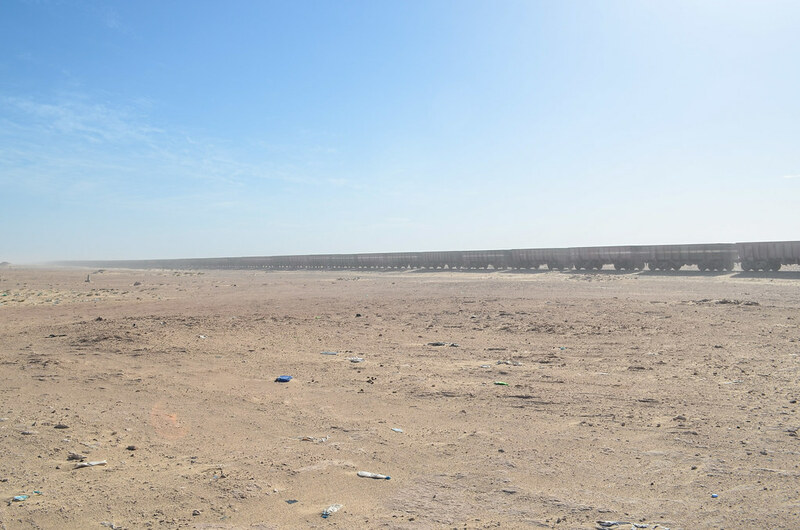 There are military barracks just before, but the border post itself is not too stressing. There is a hotel, cafés and a pricey shop just in front of the cars queuing to go through the customs. Many of them have a French of Spanish plate, as selling European cars in Mauritania (and further countries) is a big business. Old German cars sell for much more in Africa than in Europe. 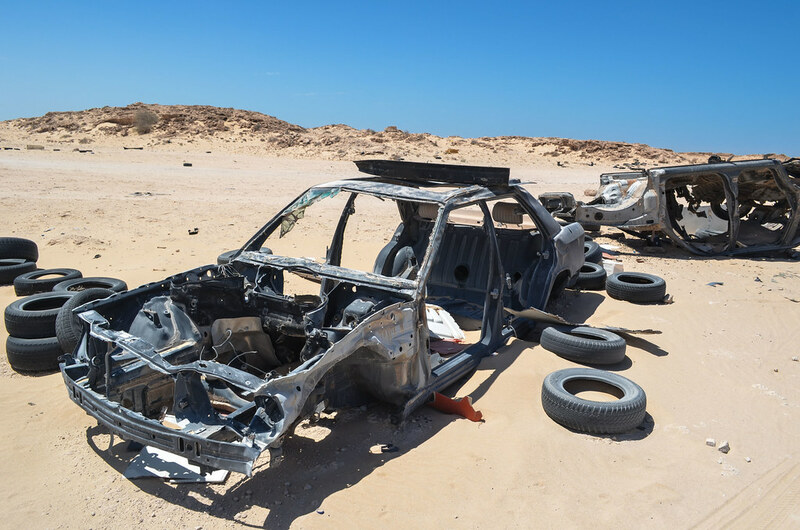 For stolen cars, there is a story that they must be driven within three days until the border to escape Interpol and the Moroccan police checks. 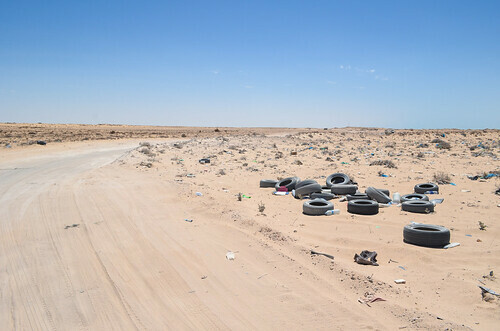 My back tire looks worse and worse and I hope to make it without problems to the other side until Nouadhibou. That’s about 60 kilometers including some piste, and I don’t want to have to change a tire in there. The side thread is now well undone and I can feel the swollen tube popping out. 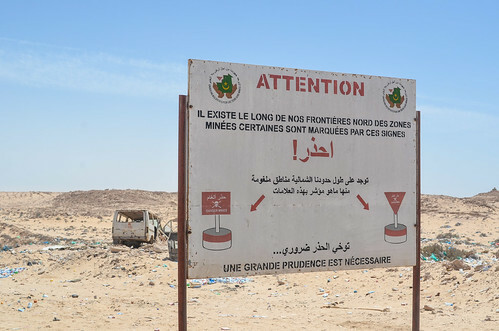 The crossing from Morocco to Mauritania is special, because the whole border between the two countries is marked with landmines. Between the Moroccan border post and the Mauritanian one, there is a 3 kilometer long piste nicknamed the No Man’s Land, belonging to no one and where people must carefully follow the piste to arrive alive to the other side. 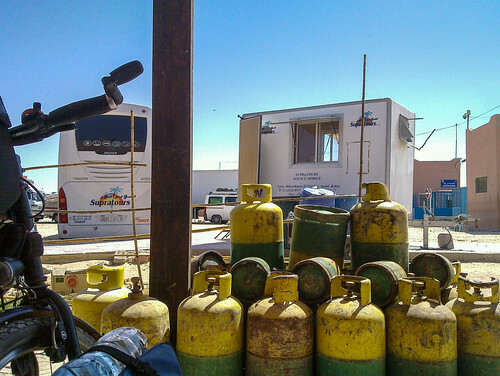 I had read much about it, including guides shouting “bomb!” at people so they pay them for a safe crossing. I am well prepared, I have the GPS trace of 2 safe pistes going through the No Man’s Land, and OpenStreetMap, surprising me every day, has even them marked, and it’s more or less matching. 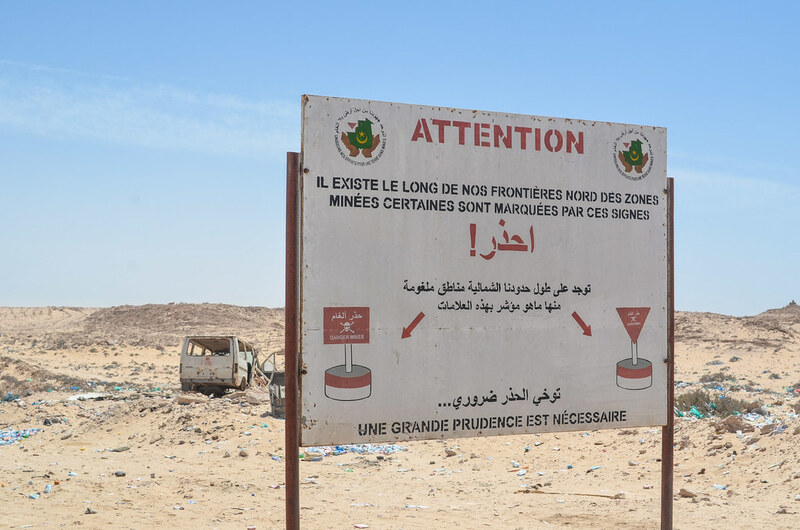 After going through the immigration and gendarmerie check, I am left to a “Mines: do not leave the road” sign at a gate into nowhere, a nowhere looking like a car cemetery and people waiting aimlessly. Nobody annoys me except a few money changers. It’s far less dangerous than the legend says, as the Mauritanian border post is visible from the beginning, and one has just to follow the cars and trucks going through the many tracks. That’s what I did, and it didn’t match the GPS traces I had but I arrived just fine. It looks more desolated than scary. The pistes are sometimes made of sand, sometimes rocks, so it’s not fun but quick. 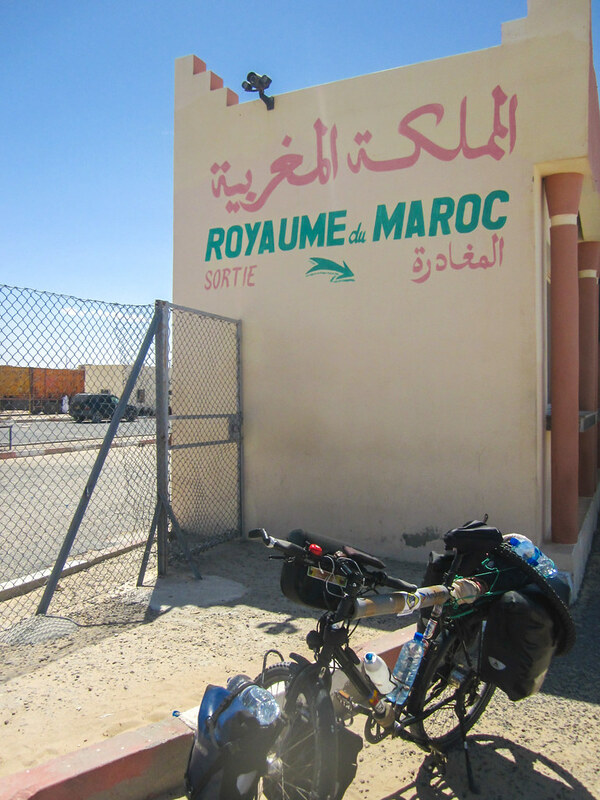 The procedures at the Mauritanian border post go quickly too. 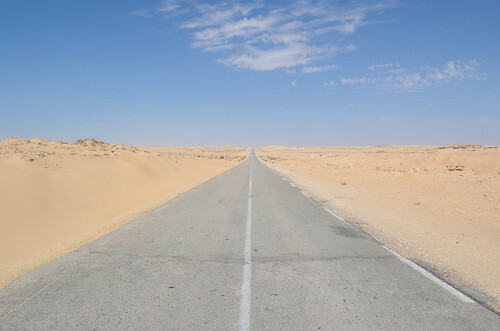 I can’t get my visa extension here but am certified that I can do it in Nouakchott and that it wouldn’t be a problem if it expires while I’m on the way. So here I am in Mauritania. 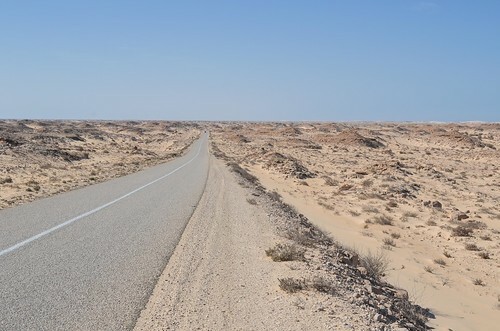 At first sight, it looks the same as before the border: a 2-lane road in the middle of sand and stones. 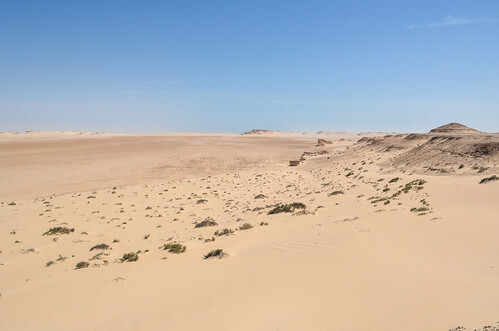 Although there is more sand on this side. 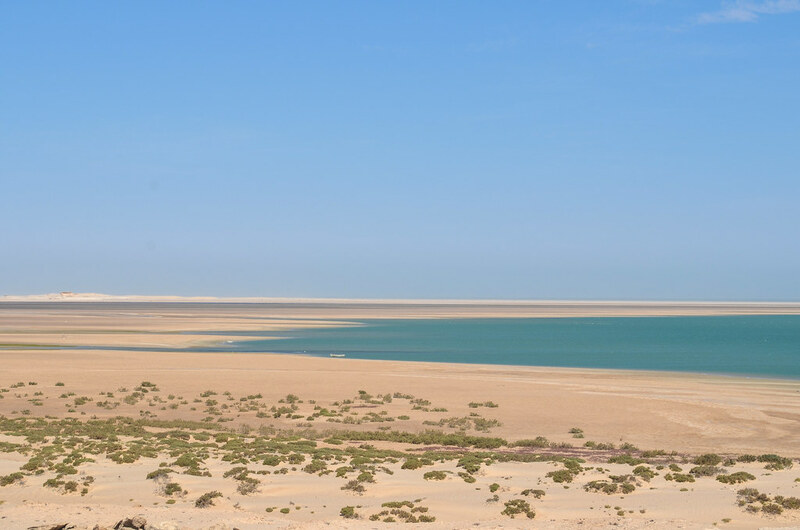 The wind is very strong and I go straight to Nouadhibou, the second biggest town of the country, at the end of a peninsula, just like Dakhla was in Western Sahara. The milestones are here every 5 kilometers, so it makes less entertainment on the way. 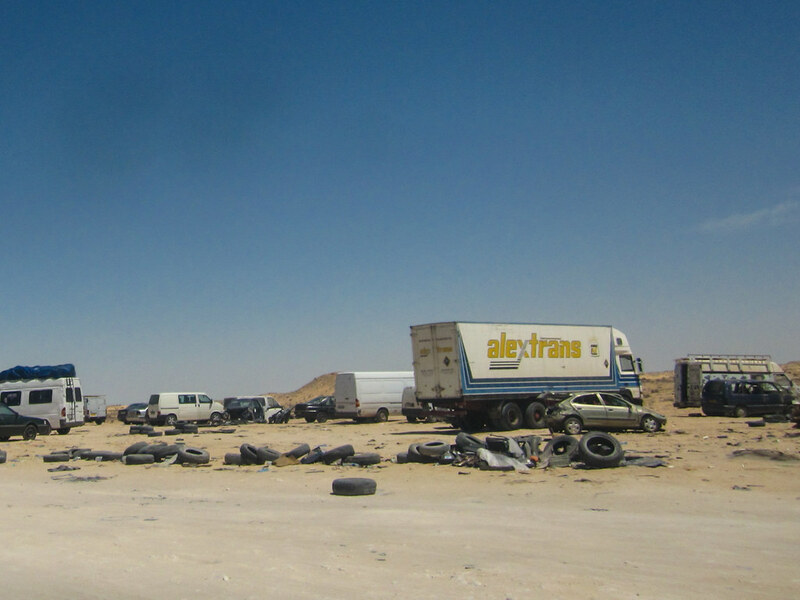 It looks a bit more disorganized, with broken down trucks and cars half or fully on the road. The checkpoints work the same way as in Morocco, I must provide my passport and travel details, but the gendarmes are far less polite and one doesn’t even get up from his mattress where he is copying my passport. I don’t mind, as I just want to get into town before my tire explodes, get a room and relax. When I stop by the road to walk and take pictures, I always remember that the area around the train tracks, parallel to the road, was mined, and even if there’s probably no danger at 99,99%, the remaining infamous 0,01% is weighting a lot against my will to run around and explore where people don’t go. At the entrance of the town, there is the passenger train station, for people hopping in the empty iron ore wagons going back to the mine in Zouerat and Fdérik. 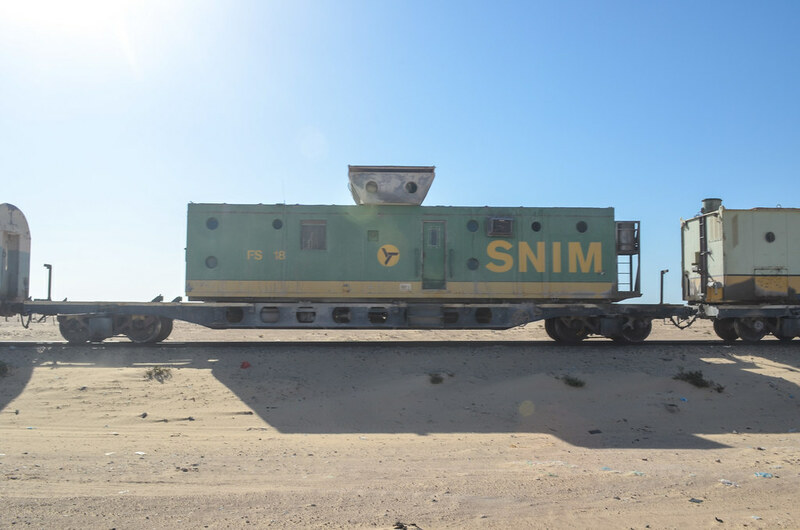 The train is property of the SNIM, the mining enterprise, biggest company in the country, in charge of the mining, transport and export of iron ore. 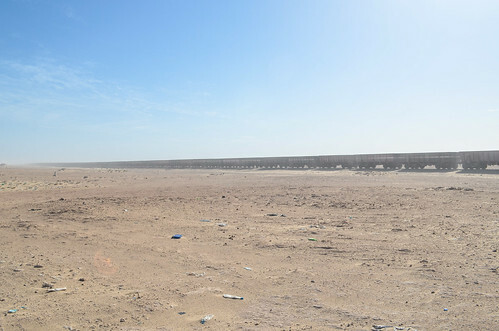 It is said to be the longest in the world, with 2 or 3 kilometers long. I have already seen the other train said to be the longest in the world, on the Sishen-Saldanha railway in South Africa, there again transporting iron ore from the Sishen mines in Northern Cape until the port of Saldhana Bay on the West Coast (it had in 1989 the world record of the longest train: 7.303 km long, 71 210 tons, 660 loaded wagons, 16 locomotives). And just as I pass the station, the train arrives. 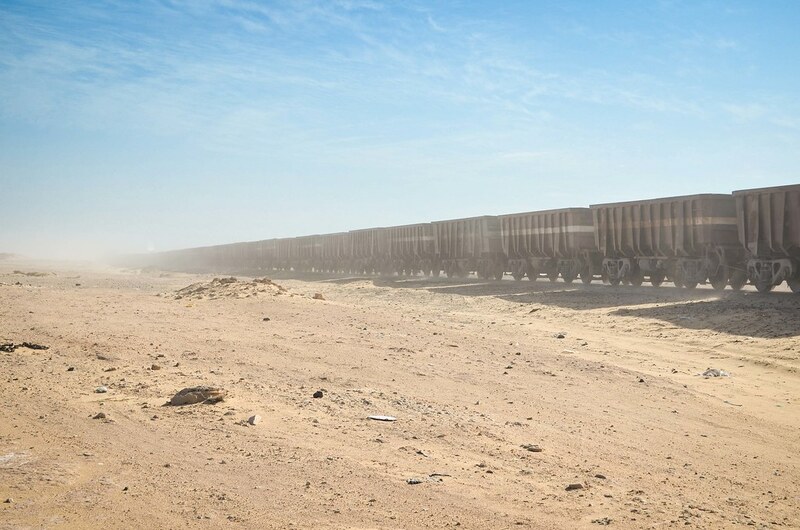 It is indeed very impressive to see the endless train pulling wagons forever out of a cloud of dust. My face is also a cloud of dust in itself, each time I pass my hands on it, I feel more sand than skin. 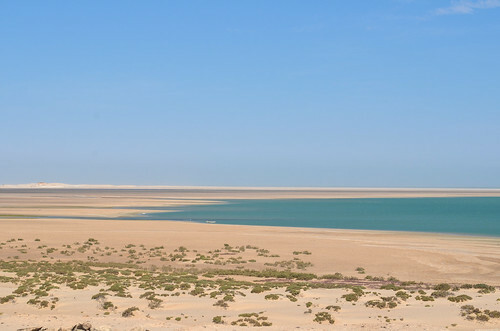 On this positive note, I enter Nouadhibou for some days of rest. 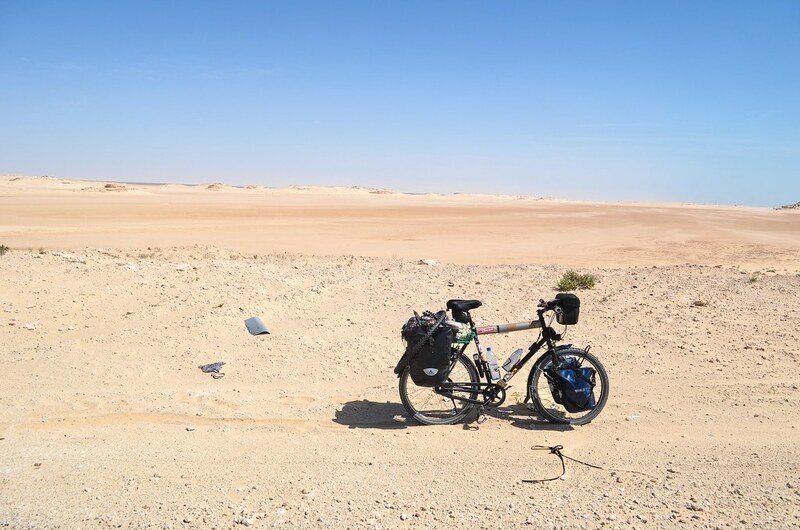 I just crossed the Western Sahara cycling but am not in a celebrating mood, first because there is in Mauritania 500 more kilometers of desert until Nouakchott, and then because I have repairs to do. My “rest days” are now following a routine I am less and less excited about, shower/wash hair/eat a lot/clean and oil bike/sleep well/charge all batteries/sort pictures/write/upload and publish, in a way that I enjoy more my cycling days when I can just pedal and watch the road and scenery passing by me. 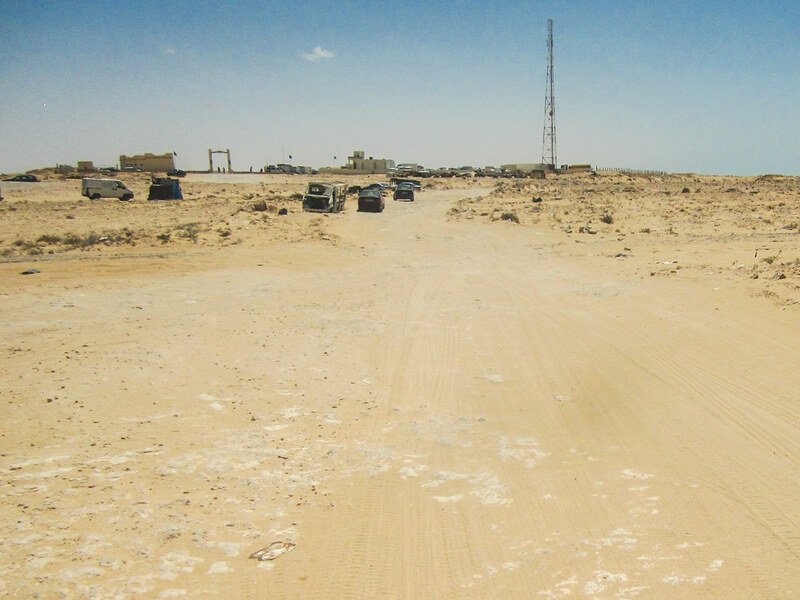 The entrance into Nouadhibou is with a 2×2 lane road, along which the city stretches for almost 10 kilometers. 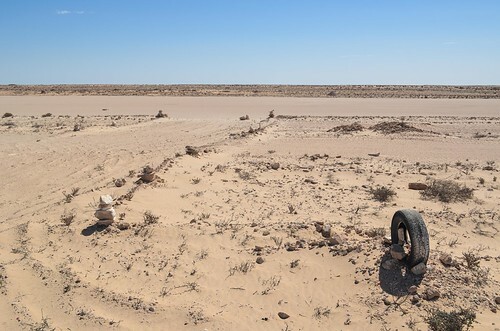 The road is half reduced by the sand and donkey carts. It seems there are as many broken down cars as goats as running cars. Although sometimes I’m surprised to see those broken down cars moving by themselves. The roundabout rule prevailing is the fastest go first. The sand is just everywhere in town, which only looks like a big mess. I thought Western Sahara would be good transition and preparation between Morocco and Mauritania, but it was not. 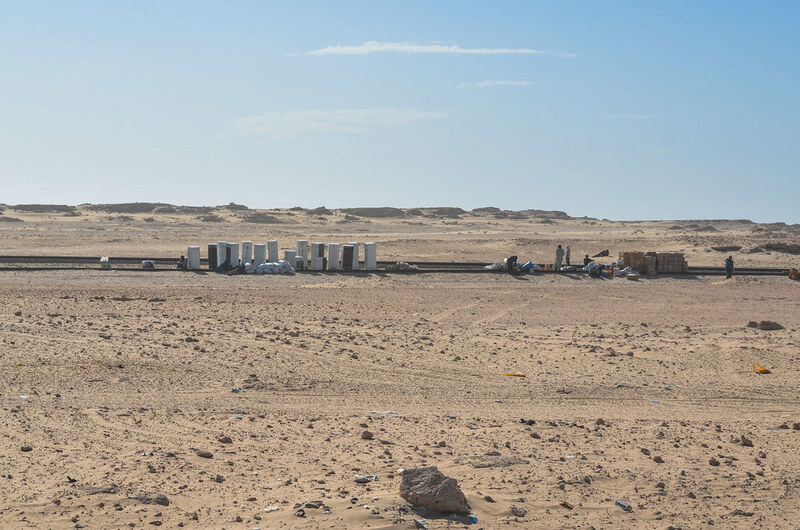 There is a huge gap at the border and Mauritania is another world, making Morocco look like Switzerland. After crossing almost the whole town, I get to an auberge and put the bike in. The tire survived but I have one spoke broken. The shower is not working because there is no electricity in town. I am told this is normal, every evening there is a power outage in the whole town (the second of the country). People walk with their cellphones on the sand that in a way marks the sidewalk from the road. I eat in a restaurant (with a cellphone torch as main light) a whole fish for just more than 1 €. 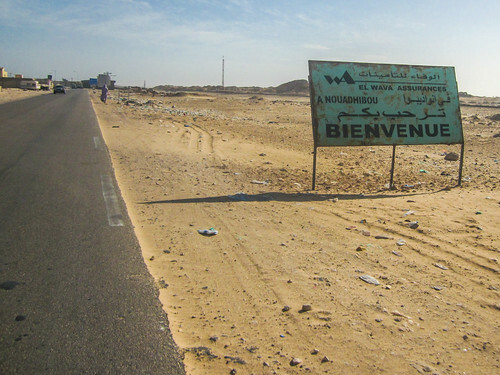 This border crossing is a bigger gap than the difference between Spain and Morocco. The electricity comes back for one hour and cuts again, leaving me with the only thing I have to do anyway, falling asleep. 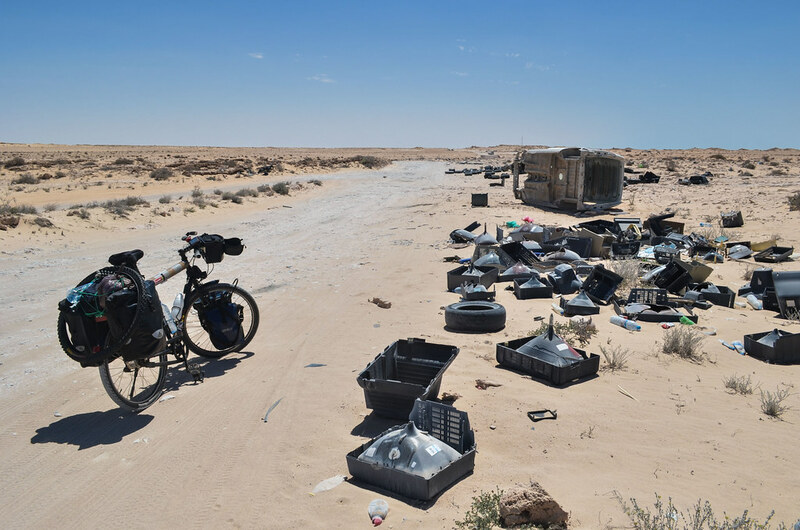 I wanted to ask… What is it like to actually do something like this (bike or backpack from one country to another)? How do you properly arrange for this? Did you rent the bicycle somewhere? It seems somewhat dangerous. What do you do if you encounter bandits? Are you carrying all your belongings since you’re never in one place for very long? That would seem to be the case since you would be changing hotels constantly. If you got robbed with all of your belongings in your possession you would be hung out to dry. What measures did you take to ensure something like this wouldn’t happen? 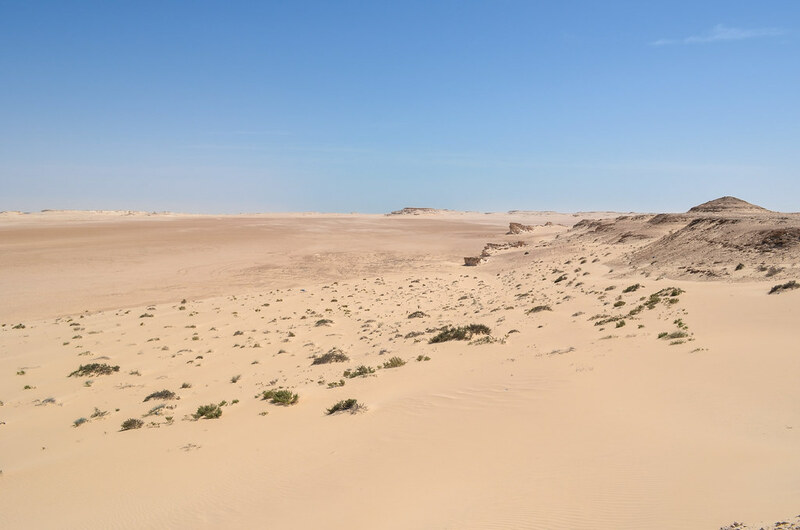 I may be asking too many questions but I’ve been to Morocco before and this story fascinates me. It’s a beautiful land and I’d love to go back and travel across it one day. You wrote “The crossing from Morocco to Mauritania is special, because the whole border between the two countries is marked with landmines.” There is no border between Morocco and Mauritania. The Western Sahara completely separates both countries. 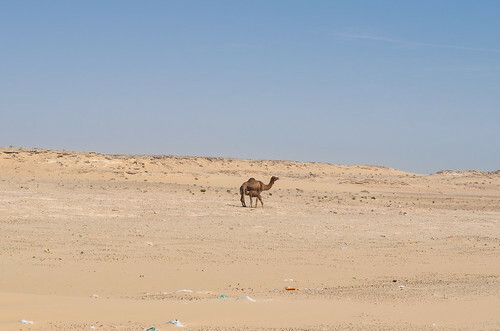 The occupied territory of Western Sahara is not internationally recognized as part of Morocco. 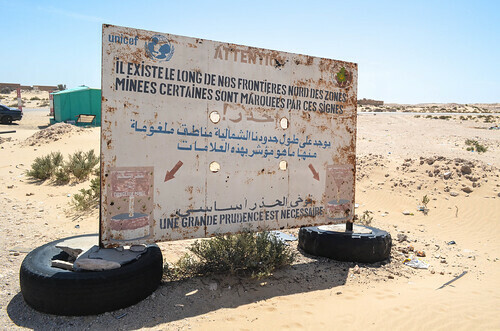 Not one country in the world recognizes the sovereignty of Morocco over Western Sahara except Morocco itself. 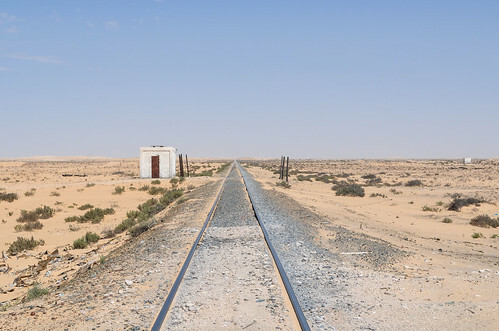 Are the boarder posts operating around the clock, or are there some particular opening times? 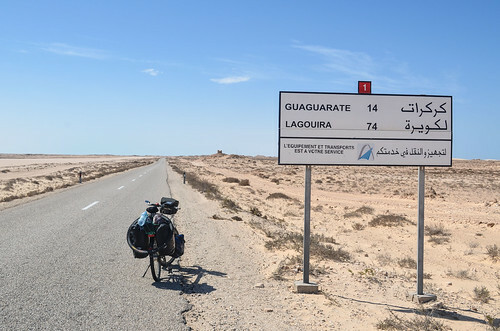 How long did it take altogether to cross from Morocco to Mauritania? Any observations for crossing on a motorcycle? Thanks in advance and good luck with your travels! No, the border is closed at night. There was a long queue of cars that I skipped, I don’t know if they will let you do that with a motorbike. 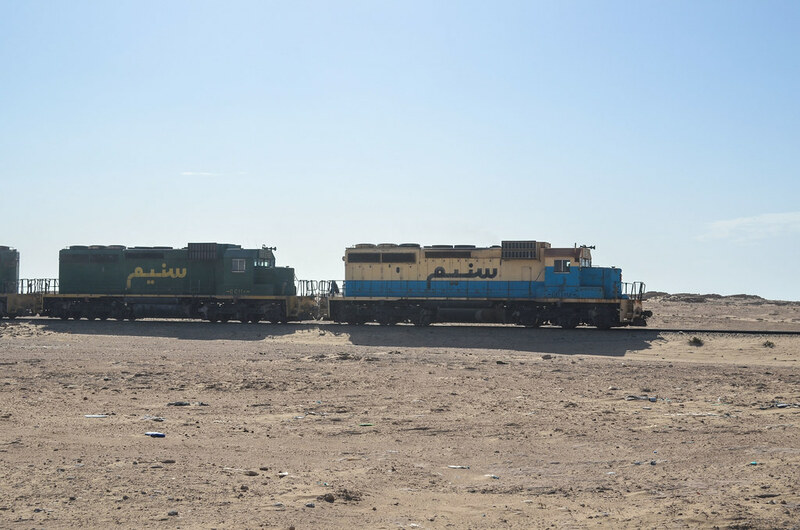 The crossing is only 3 km of track +2 border posts, you can count on 1 hour min if it is not busy. 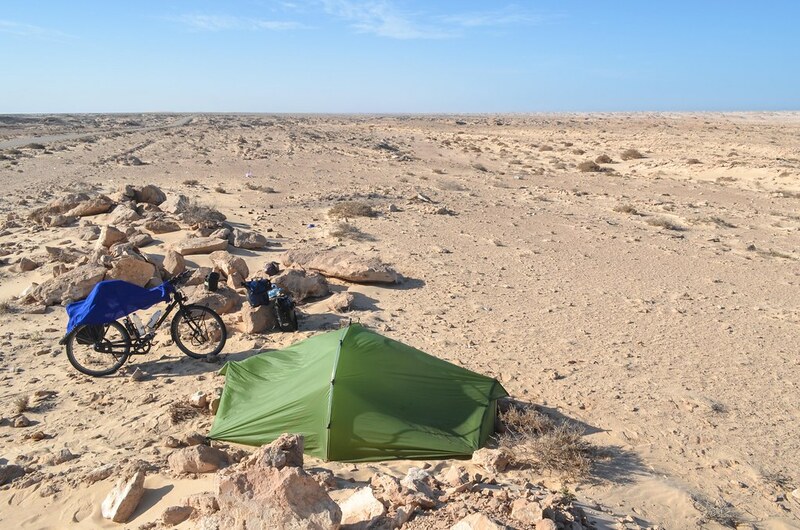 You can sleep on the Moroccan side if you arrive too late. The town 80 km before has hotels too.Anyway, make sure you have all your documents in order for the bike and it should go well. I am, in all honesty, so amazed at this journey you are taking. You are brave, and really such an inspiration. I really hope you get all you want, whilst remaining safe along your way. Although I am sure it is not purely for us to see, thank you for blogging about this soul searching mission you are on. I look forward to reading the next chapter of your journey. Be well.